On April 18, 2014, NASA's Lunar Atmosphere and Dust Environment Explorer (LADEE) ended its mission by crashing into the moon. See how it happened in our On This Day in Space videos series! This is the last photo that the Israeli moon lander named "Beresheet" took before it crashed into the surface of the moon in a failed landing attempt last week. 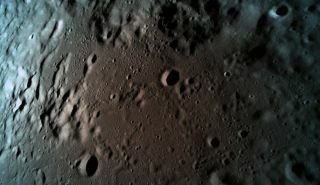 This Is the Last Photo Israel's Beresheet Moon Lander Ever Took It's a view of the pocked lunar surface from 9 miles up. Astronomers Finally Spot Universe's First Molecule in Distant Nebula It was the first molecule to form after the Big Bang. Stopping an Earth-Bound Asteroid in its Tracks (Op-Ed) We really need to plan ahead. Notre Dame Fire Damage Spotted from Space (Photo) There's a blackened husk where the spire used to be. Einstein's theory of relativity is super important in the new "Avengers: Endgame" teaser trailer and at the end of "Captain Marvel."